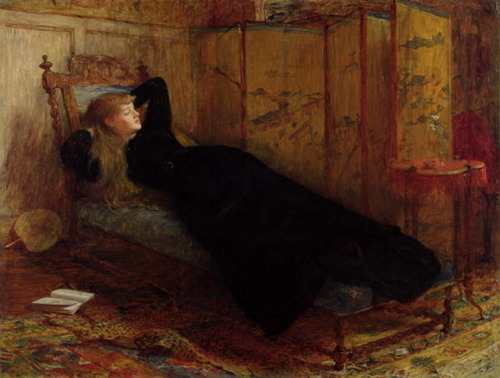 Valentine Cameron Prinsep (1838–1904), Dolce Far Niente (Sweet Repose) (1885), oil on canvas, 63.5 cm. x 76.2 cm, Private collection. Wikimedia Commons. The Italian phrase dolce far niente means (literally) sweet doing nothing – it is the very enjoyment of being idle, the indulgence of relaxation, blissful laziness. If ever there was a hallmark of a painting from the Aesthetic movement, surely it is one titled dolce far niente. In this article, I am going to use paintings with that title as markers for the development of Aestheticism in painting in Europe and America, and try to establish common features of this select cross-section of paintings. Prior to 1800, there do not appear to have been any significant (surviving) paintings with the title Dolce Far Niente. Franz Xaver Winterhalter (1805–1873) Dolce Far Niente (1836), oil on canvas, 148.6 × 116.8 cm, Private collection. Wikimedia Commons. The earliest surviving painting of this title appears to be the most unusual: it is by Franz Xaver Winterhalter, and dates from 1836. 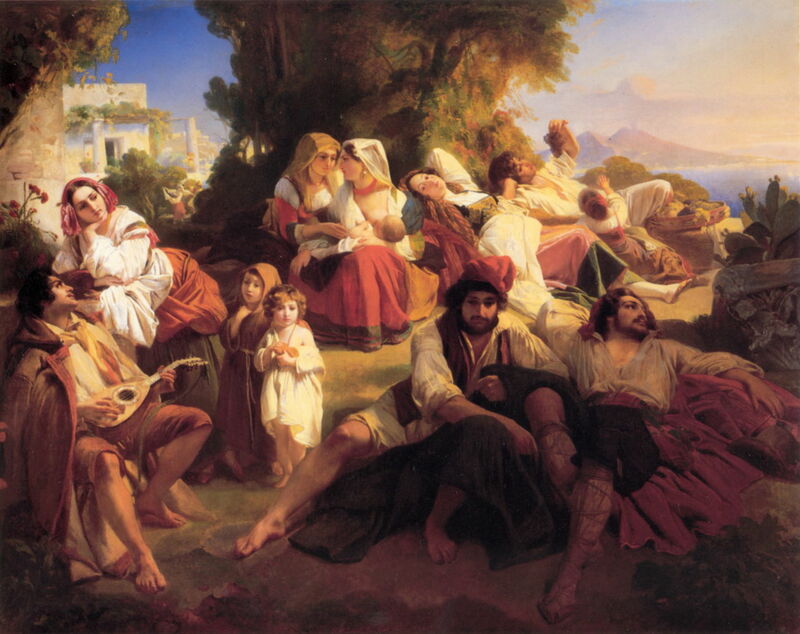 A group of four men, four women, and four children are shown in idle repose in a garden, with Mount Vesuvius in the distance. These are presumably rich Neapolitans, although one of the women has a baby feeding from her breast. One plays a small lute-like instrument, and fruit is piled in a large tambourine. Long preceding the Aesthetic movement, this painting appears to meet several of its principles: it serves no other purpose than art, is has no narrative and is devoid of symbols, action, or activity, and alludes to other arts (music) and senses (several). Frank Buchser (1828–1890), Dolce Far Niente (1857), oil on canvas, 64 × 76.5 cm, Private collection. Wikimedia Commons. 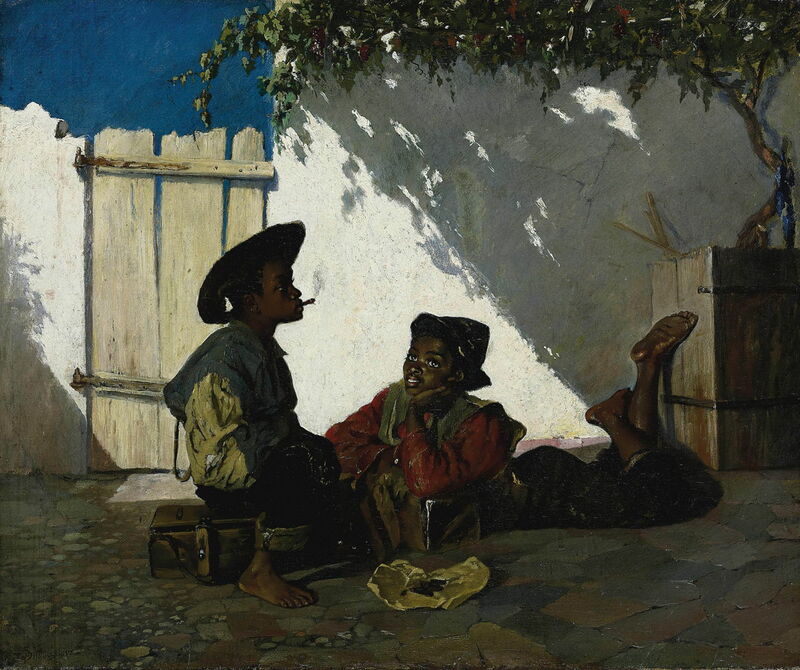 Another early and atypical painting is that by Frank Buchser in 1857, which shows two young boys smoking and idling in the shade, presumably in some idyllic version of the southern USA. This lacks the allusions to other arts or senses. Swiss-born, Buchser visited the USA and took photographs there in 1866, after the Civil War, but I wonder if this painting was made during an earlier visit, perhaps. William Holman Hunt (1827–1910), Dolce Far Niente (1865-75), oil on canvas, 99 × 82.5 cm, Private collection. Wikimedia Commons. 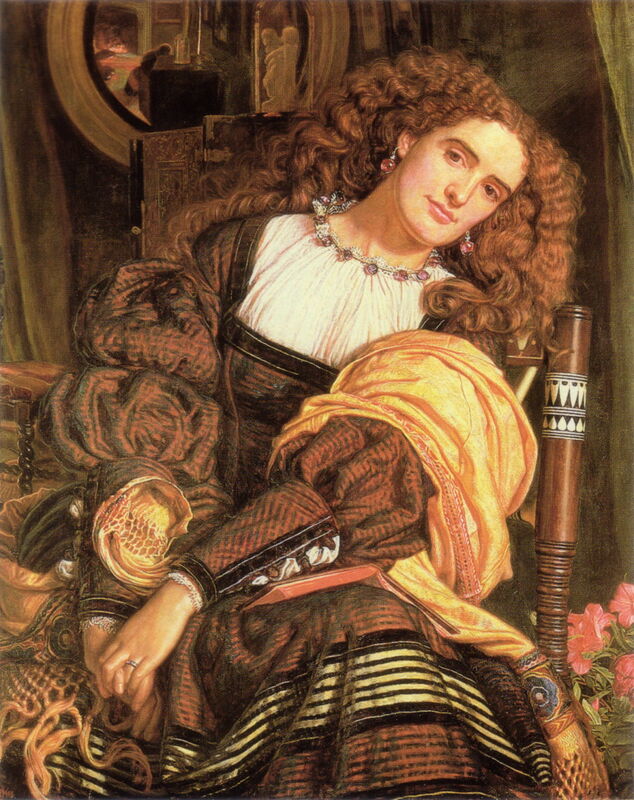 Much better-known is the first of the ‘Pre-Raphaelite’ versions, William Holman Hunt‘s, which he worked on between 1865-75; it may have been started as early as 1859, which would coincide with Dante Gabriel Rossetti’s early ‘Aesthetic’ works. This is the first to follow what became an established pattern: one beautiful woman in repose, looking idly into the distance. The clothing and furnishings are elaborate and highly-detailed. The reflection in the mirror above the woman’s head shows this to be a domestic scene, with another figure leaning over a large wooden bureau or a dressing-table, perhaps. The visibly affluent woman wears a wedding ring, and her fingers are interlocked, suggesting slight tension, as she leans her head to her left and looks beyond the picture-plane, her face emotionless. William Quiller Orchardson (1832–1910), Dolce Far Niente (1872), oil on canvas, 76.2 x 99.7 cm, Private collection. Wikimedia Commons. In 1872, before Hunt had finished retouching his painting, William Quiller-Orchardson completed his, incorporating in its printed screen a ‘modern’ flavour of Japonisme. His woman, dressed in sober black, reclines on a chaise longue, her open book and fan beside her as she stares idly out of an unseen window. Auguste Toulmouche (1829–1890), Dolce Far Niente (1877), oil on canvas, 54 × 40 cm, Private collection. Wikimedia Commons. 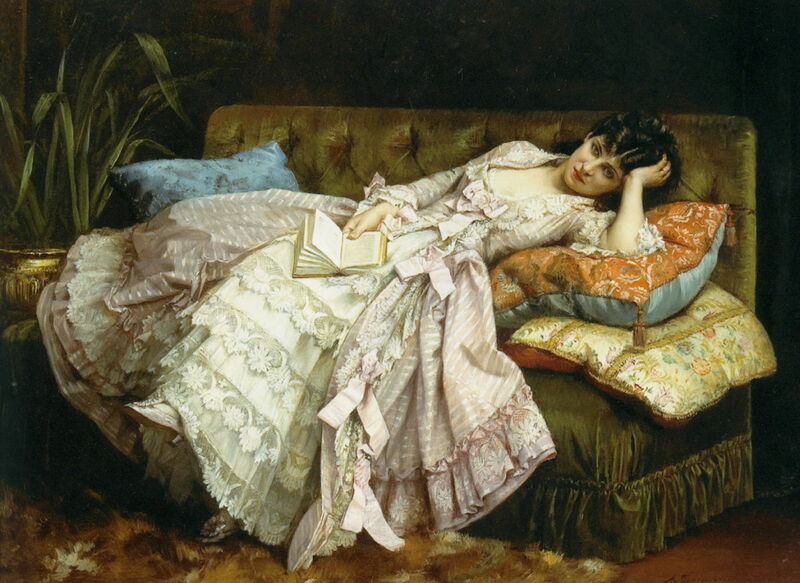 Shortly after, in 1877, Auguste Toulmouche painted his version, again one beautiful woman lost in languid thought. A book is open on her lap, but her attention has wondered, and she stares blankly towards the viewer. 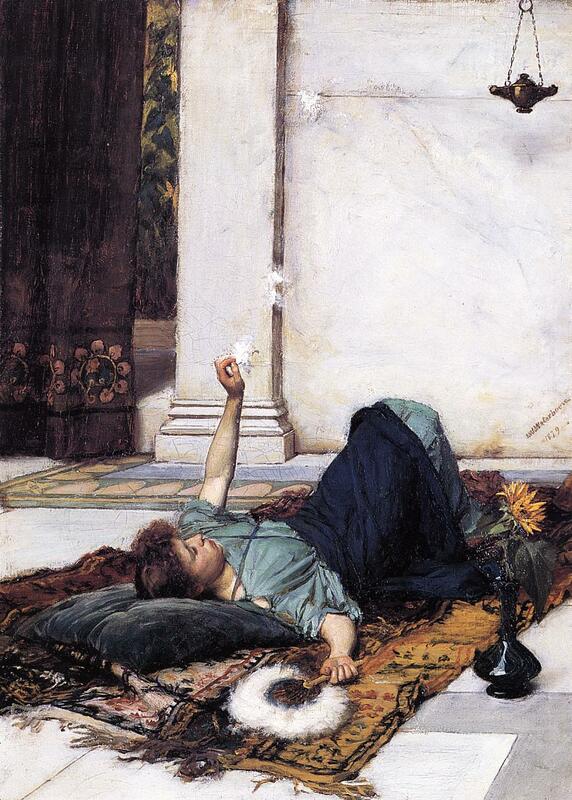 John William Waterhouse painted two quite different works to which the title Dolce Far Niente is attached. This, also known as The White Feather Fan, painted in 1879, and sometimes erroneously attributed to Frederic, Lord Leighton (despite the obvious signature), is more classical in its setting, with an oil lamp hanging high on the right, the feather fan, and carpets rather than a couch. Its lone woman is plucking feathers from the fan and watching them rise through the air (as shown by the slightly ambiguous white patches). Her facial expression is not visible, making it impossible to read her emotion. Waterhouse‘s second painting from the following year (1880) is formally classical Roman, the fan now made from peacock feathers. Its lone woman reclines amid pigeons and picked flowers, on a crumpled sheet and a leopard skin. 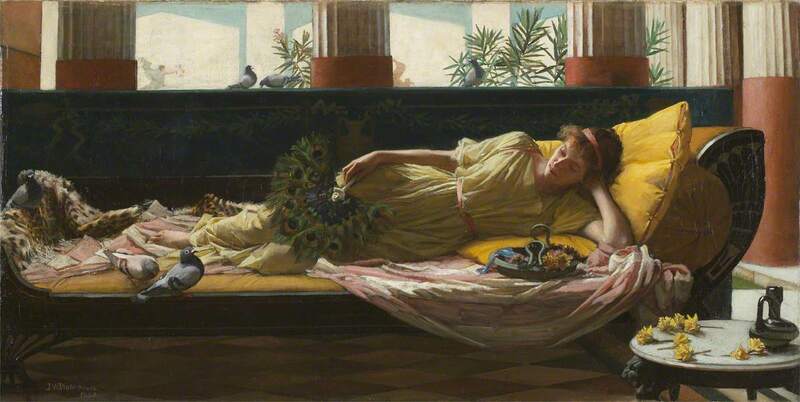 Charles Edward Perugini (1839–1918), Dolce Far Niente (1882), oil on canvas, dimensions not known, Walker Art Gallery, Liverpool, England. The Athenaeum. 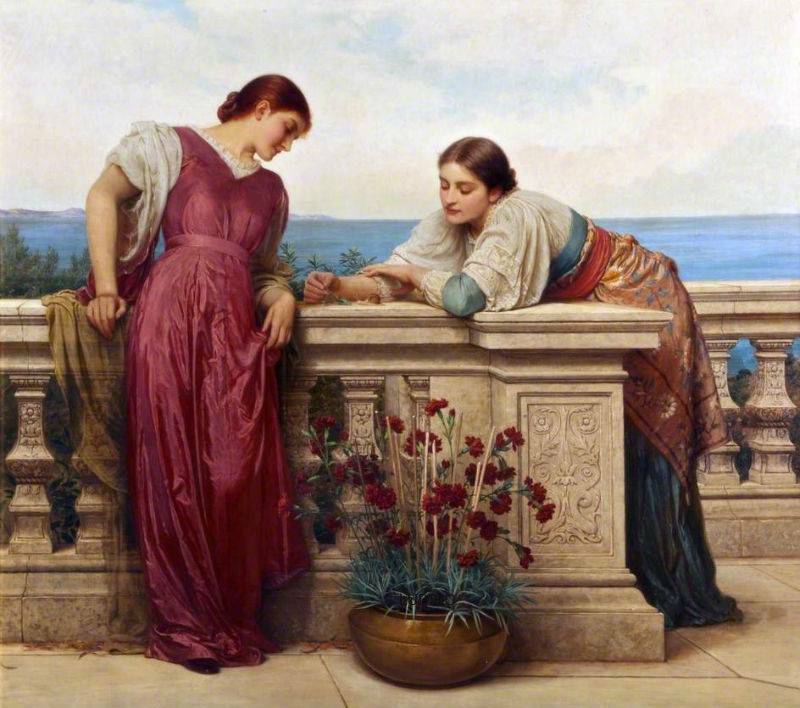 Just a couple of years later (1882), Charles Edward Perugini was the first to pose two beautiful women in his painting. Although they are interacting very little, in their idleness they are enticing a snail with a fragment of leaf. A trivial act, it starts raising questions of narrative or symbolism which put its Aesthetic ideals in danger. Lawrence Alma-Tadema (1836-1912), A Female Figure Resting (Dolce Far Niente) (1882), oil on canvas, 23.5 x 15.9 cm, Private collection. Wikimedia Commons. 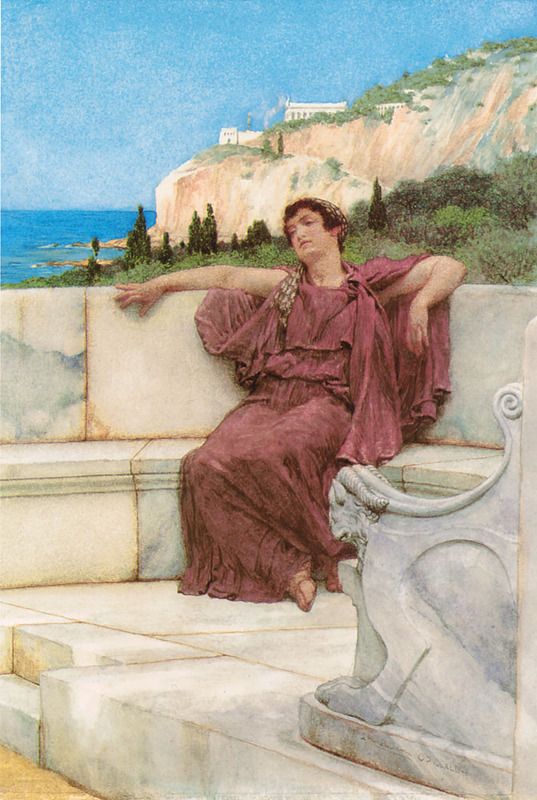 The same year, Lawrence Alma-Tadema painted his A Female Figure Resting, which is also known as Dolce Far Niente. His lone woman looks strangely tired, and slightly more masculine that her predecessors. As ever, Alma-Tadema delivers a solid marble setting, and an interesting coastal landscape background. Frederick Arthur Bridgman (1847–1928), Dolce Far Niente (Sweet Nothings) (c 1885), oil on canvas, 50.2 × 60.3 cm, Private collection. Wikimedia Commons. In about 1885, Frederick Arthur Bridgman painted this more original interpretation, which is also known as Sweet Nothings. 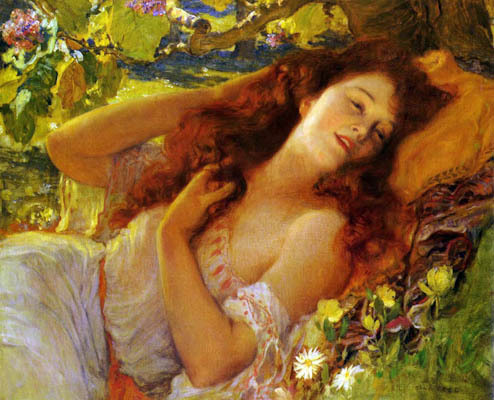 Its lone woman plays with her hair while she dozes with her eyes half-closed in a hammock, surrounded by flowers and leaves which are lit by the sunshine. 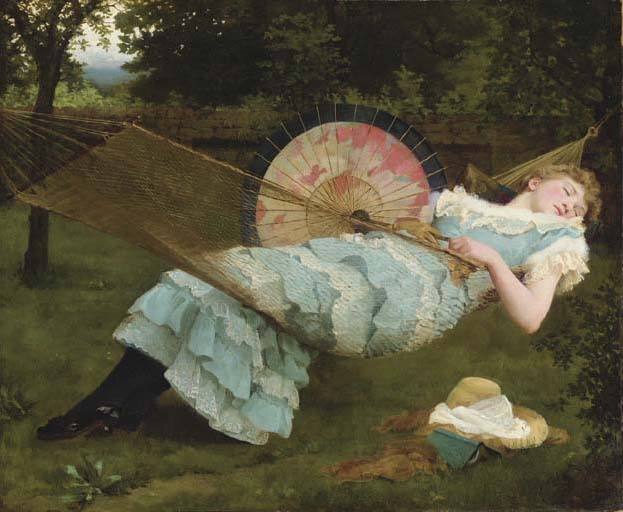 Val Prinsep‘s lone woman has gone as far as falling asleep in her hammock, but still holds a Far Eastern parasol to invoke Japonisme. Below her, with her hat, is a book, and the scene is placed in a country garden in summer. This painting was also known as Sweet Repose. 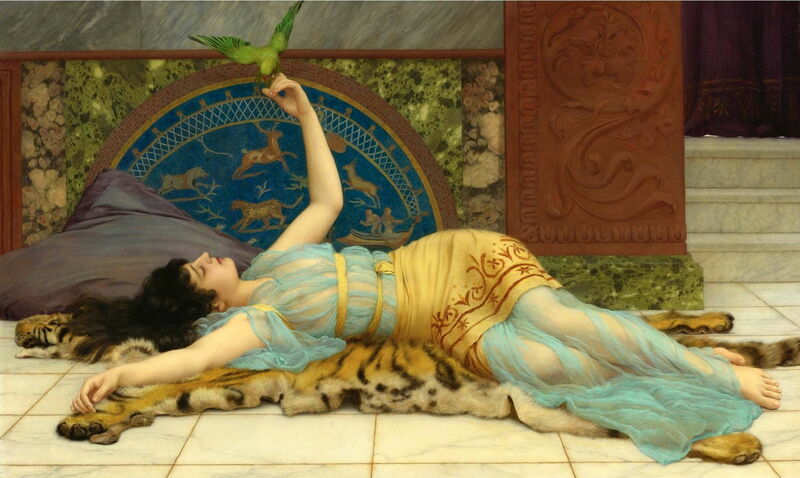 John William Godward (1861–1922), Dolce Far Niente (1897), oil on canvas, 77.4 x 127 cm, Private collection. Wikimedia Commons. The most devoted painter of Dolce Far Niente, though, was John William Godward, who produced at least three different versions, starting in 1897. This returns to a classical Roman setting, and introduces a brilliant green parakeet, with its bright red bill. This type of play with parrot-like birds may have been established as a symbol that the woman is a courtesan (at best), which may be supported by her posture on a tiger-skin, and her diaphonous dress. John William Godward (1861–1922), Dolce Far Niente (Sweet Idleness) (or A Pompeian Fishpond) (1904), oil on canvas, 50.8 x 76.2 cm, Private collection. Wikimedia Commons. 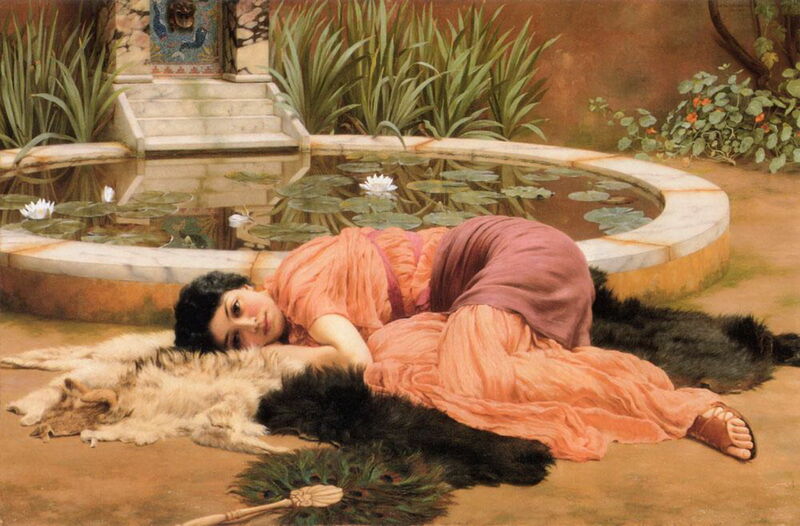 Seven years later (in 1904), Godward painted his more complex version, also known as Sweet Idleness, or A Pompeian Fishpond. More modestly-clad, his lone woman rests with her knees drawn up into a sleeping (near-foetal) position on another animal skin, with a peacock-feather fan in the foreground. John William Godward (1861–1922), Dolce Far Niente (1906), oil on canvas, 36.2 x 73.7 cm, Private collection. Wikimedia Commons. A couple of years after that (in 1906), Godward’s beautiful woman is stretched out on an animal skin on marble, a colour-co-ordinated garden and distant Mediterranean waterscape beyond. John Singer Sargent (1856-1925), Dolce Far Niente (c 1907), oil on canvas, 41.3 x 71.7 cm, Brooklyn Museum (Bequest of A. Augustus Healy), New York, NY. Photo courtesy of Brooklyn Museum. 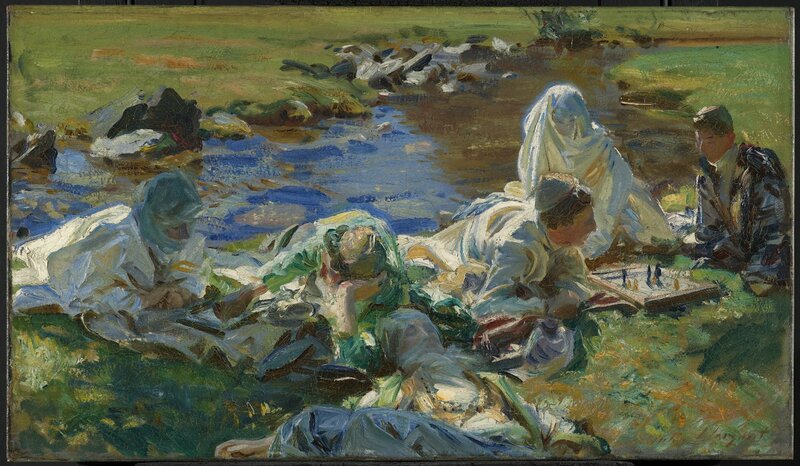 My final example is a break from that succession: John Singer Sargent‘s ‘Oriental’ oil sketch of about 1907, showing three young men and three young women, dressed in ‘Oriental’ attire, and playing chess by the side of a clear stream. Presuming that Sargent chose the title, I wonder if he was aware of its recent connotation? For over the course of the preceding forty-six years, it had become associated with Aestheticist paintings, almost devoid of story or symbols, showing a beautiful lone woman in repose. Perhaps his use was to make clear that – whilst his art was for art’s sake – he had not chosen the way of the Aesthetic movement. Posted in General, Painting and tagged Aestheticism, Bridgman, Buchser, Godward, Hunt, painting, Perugini, Prinsep, Quiller-Orchardson, Sargent, Toulmouche, Waterhouse, Winterhalter. Bookmark the permalink.